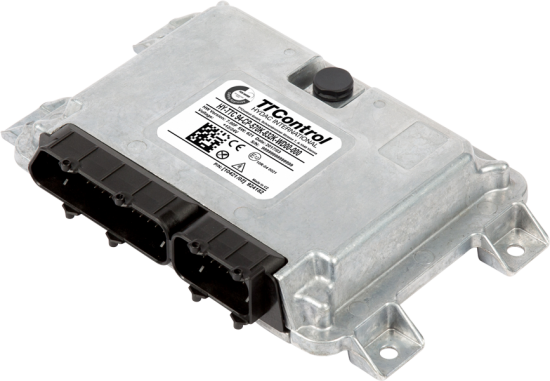 The HY-TTC 94 is an extremely robust and powerful electronic control unit for use in automotive applications. This controller compliance with the international EN ISO 13849 standard and has been certified by TÜV Nord. It meets the requirements of Functional Safety according to Performance Level (PL) d. The HY-TTC 94 is equipped with the Infineon XC2287M CPU providing enhanced safety features for protecting internal RAM and flash. The control unit supports programming in C (MATLAB Simulink I/O block library available) and is protected by a compact, automotive housing suited to various applications in harsh environments. As a Vehicle Control Unit (VCU), the HY-TTC 94 is already in use in Aptera 2e. Its integrated monitoring CPU continuously monitors all safety-related inputs and outputs. In case of error, it transfers the application to a pre-defined safe state. As a Battery Management System (BMS) Master in the battery concept of Akasol Engineering, HY-TTC-90 assumes the overall battery control and monitoring of all safety-related functions. As Torque Supervising Unit (TSU) the control unit acts as an add-on watchdog unit, which evaluates the actual torque produced with the help of analysis of the electrical signals of different components in the drivetrain. The actual torque produced is determined and continuously monitored by a comparison with the desired torque. The TSU has been used successfully in a fleet in various electric vehicles. Starter/development kits are available for working with the ECU. The kit is delivered in a handy case and the advantage lies in the fast orientation and development with the HY-TTC 94, as well as cost savings compared to the individual prices of the contained products.